War Grave Register notes: RADNELL, Tpr. Joseph Charles, 469, M.M. 1st Australian Light Horse Machine Gun Sqdn. Killed in action 4th Aug., 1916. Age 26. 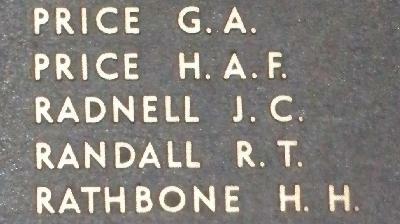 Son of Ambrose Pain Radnell and Emily Mary Radnell, of Tarnagulla, Victoria, Australia. B. 78. Mention in despatches awarded, and promulgated, 'London Gazette', Supplement (1 December 1916); 'Commonwealth Gazette' (19 April 1917).